ver the next 10 years, with the support of USA Exim Bank, the private sector and the Chinese Government, we will meet demand by Chinese consumers for leisure and exports, by building 10 AmericaTowne® Tourism Development and Trade Centers across China at a Cost of $151 million per Center having a total direct investment of $1.5 Billion dollars. We anticipate each center to be located on 1,000 mu. We expect to commission the Zhou Brothers (the internationally known Chinese American artists) to create an original major sculpture identifying each Center and tying each Center to a theme that focuses on US and China culture and attributes from the surrounding Community. The Nanning Zhou Brothers International Art Valley in Nanning China will house the very first AmericaTowne® Tourism and Trade Center. To develop the Center, Yilaime Corporation, expect to work with the United States Export and Import Bank, the local Chinese government officials and the Zhou Brothers. 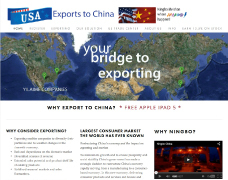 Over the next 10 years, with the support of USA Exim Bank, the private sector and the Chinese Government, we will meet demand by Chinese consumers for leisure and exports, by building 20 AmericaTowne® Tourism Development and Trade Centers across China at a Cost of $151 million per Center having a total direct investment of $3 Billion dollars. We anticipate each center to be located on 1,000 mu. We expect to commission the Zhou Brothers (the internationally known Chinese American artists) to create an original major sculpture identifying each Center and tying each Center to a theme that focuses on US and China culture and attributes from the surrounding Community. The Centers will create jobs and business opportunities in China and the USA. As a result of the USA based company and Centers, over 1,000 new businesses; 20 hotels; 1,000 villas and 20 theme parks, and 20 senior care and wellness centers will be created, employing directly and indirectly 73,000 people in China and the USA. It is expected that the USA based Company and Centers will generate over $3 Billion in labor income and have a direct total economic benefit of approximately $10 billion. The Nanning Zhou Brothers International Art Valley in Nanning China will house the very first AmericaTowne® Tourism and Trade Center. To develop the Centers, the Corporation, expects to work with the United States Export and Import Bank, the local Chinese government officials, the Zhou Brothers and other investors. For the past three years, at the invitation of a China’s City mayor and other government officials in China, key staff and team members have lived and worked in China, researching and studying consumer trends, and helping to develop tourist and leisure projects for the Chinese consumer. While in China, we have had the opportunity to work with local government officials, city mayors and Provincial Governors and mid-size Chinese companies. Strategically, our focus is to target and develop leisure opportunities for China’s growing affluent and middle class consumer.